Seven Minutes With God is a brief summary of how to plan a daily quiet time that recaptures the intimacy of communion with Jesus Christ in order to start the day with the blessings of God. In 1882, a group of students from the campus of Cambridge University coined the phrase "remember the morning watch." These students realized unless they intentionally made time for God before the day began, then the activities of the day would make it almost impossible to spend time with God during the day. Recapturing the intimacy of communion with Jesus Christ in their daily Quiet Times inspired these students to greater levels of commitment to the work of God in missions. "A remarkable period of religious blessing followed and culminated in the departure of the Cambridge Seven, a band of prominent athletes and men of wealth and education, for missionary service. They gave up everything to go out to China for Christ." 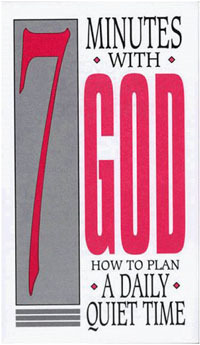 Seven Minutes With God by Robert D. Foster is a small booklet that explains how to plan a daily Quiet Time. One of the most difficult aspects of spending Seven Minutes With God is actually getting out of bed and making this time available. Let this little booklet inspire you to recapture your intimacy with Jesus Christ. As the psalmist said, "Morning by morning, O Lord, you hear my voice; morning by morning I lay my requests before you and wait in expectation" (Psalm 5:3). Preparing Your Heart! The first step in spending Seven Minutes With God is preparing your heart to hear some words from God. Preparing your heart says to God, "Open my eyes that I may see wondrous things from Your Word" (Psalm 119:18). Prayer is the basis for preparing your heart to hear a word from God. Reading the Word! The next step in spending Seven Minutes With God is reading your Bible. Read your Bible and allow God to speak to you through His Word. A good place to start reading God's Word is the gospel of Mark or the gospel of John. Speaking To God! After God has spoken to you through the reading of His Word, the final step is you speaking to God in prayer. When God has revealed His Truth to you, it is important to pray these truths into your life. If God has spoken to you about forgiveness, ask God to help you to embrace forgiveness in your life. If God has spoken to you about surrender, ask God to help you surrender your life to His will. Adoration - Adoration is prayer that reflects on God's greatness, goodness, power, majesty and sovereignty. Confession - Confession follows adoration. When you acknowledge the majesty and sovereignty of God, it is good to make sure that every sin is cleansed and forsaken. Thanksgiving - Thanksgiving is simply expressing your gratitude to God. In fact, the Bible tells us to give thanks in everything, for this is the will of God in Christ concerning you (1 Thessalonians 5:18). Supplication - Supplication is making your petitions known to God. You may be asking God on behalf of others or you may be asking God for something specific for your life. Spending time with God in the morning will set a precedent for your whole day. 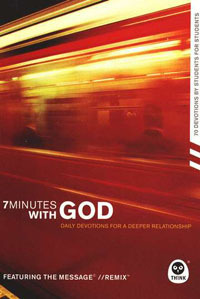 If you need help, then 7 Minutes With God - Daily Devotions For a Deeper Relationship is for you.